There are no shortage of alarming conclusions to be drawn from a new—and already much-debated—UC Davis Center for Watershed Sciences analysis of the impact of this year’s drought on California’s agricultural economy. But it’s what’s not being discussed that really matters. The study’s most widely noted projection is the sheer size of the economic hit ($1.7 billion) and job losses (over 14,000 workers) expected in the Central Valley due to scaled-back water deliveries. The state has quickly passed legislation to address some of these issues, though, and, as the UC Davis report and others have pointed out, even a dip in the billions of dollars won’t have a lasting impact on the vast California economy (at least not this year)—causing losses of less than 5 percent in an industry that itself makes up less than 3 percent of gross state product. That, for the most part, is where most news coverage of the report, which was prepared for the California Department of Food & Agriculture, has stopped. But that’s not all the study shows. Most of the state’s economy may not be affected by this year’s drought, in spite of the more than 400,000 acres of farmland likely to be left fallow this year—an area the size of the cities of Los Angeles and San Jose combined. For farm communities in the San Joaquin Valley, though, where most of the farmers being forced to fallow their fields live—and where agriculture is the major source of jobs—the drought’s impacts will be very real. Some projections show unemployment rates in parts of the valley climbing as high as 40 percent. Even that isn’t the most daunting issue raised by the report, however, which concludes that the only reason the drought’s impact won’t be worse is Central Valley farmers’ reliance on pumping huge quantities of groundwater—from the very regions, the San Joaquin Valley and Tulare Lake basins, where groundwater overdraft has been a serious problem for decades. California’s economy, and its ag industry as a whole, may emerge relatively unscathed from this year’s water shortages, in other words, but the massive water delivery cuts caused by the drought—combined with the way growers have responded—are raising new questions about the scope of the state’s long-term water challenges. They may even reshape the policy debate about how to prepare the state for future droughts. Or at least they should—a case the Summit has been making for months. 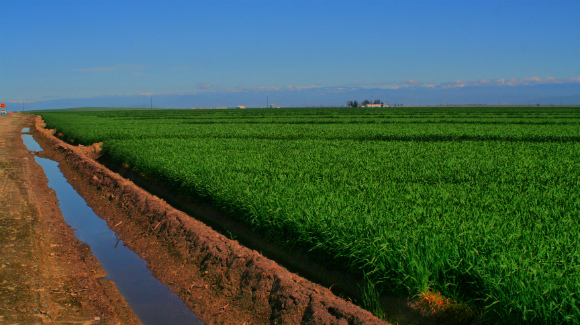 The Central Valley’s ag industry uses about 20 million acre-feet of water each year, much of it delivered from the state and federal water systems, according to the UC Davis report—about as much as the annual water consumption of nine to 12 million residential households. But in the report’s “preliminary drought scenario,” the region is expected to see water deliveries reduced by a total of 6.5 million acre-feet—a cut of an incredible 32.5 percent. Growers have already found a short-term solution: Pumping groundwater—and on a grand scale. Using Department of Water Resources estimates of groundwater pumping from 2006-2011, the report estimates that the ag industry will pump out roughly 5 million acre-feet of groundwater this year—making up all but a fraction of its water losses. “Without access to groundwater, this year’s drought would be truly devastating to farms and cities throughout California,” said one of the report’s coauthors, Jay Lund, director of the Center for Watershed Sciences and a UC Davis professor of civil and environmental engineering. Still, it is the scale of the Central Valley’s water shortfall and the amount of groundwater being pumped to make it up that is giving experts pause. Much has already been said this year about the strain groundwater pumping is putting on the state’s long-overused aquifers and the challenges of instituting a groundwater system to more sustainably manage this system. But if this drought continues for several more years—or if another drought like it comes along again anytime soon—closing a 5-6 million acre-foot gap will demand a set of water policies that would test the limits of what is considered politically viable in Sacramento. Since the drought began, Central Valley leaders have been pushing the state to build more storage facilities to capture a more reliable supply of water for growers. But more than 70 years after the first reservoirs were built in California—and with the best storage sites used up by over 1,400 dams—it is not clear where 5-6 million acre-feet of surface storage would come from. That is more water, after all, than the capacity of the state’s biggest existing storage facility, Shasta Dam, which holds only 4.5 million acre-feet. What the UC Davis report shows, in other words, is that to support an agricultural economy that feeds the world—while also providing enough drinking water for a population climbing toward 50 million in the next 30 years that will put new demands on an energy system expected to account for 90 percent of the growth in water use during that time—California will have to find solutions that go far beyond storage. Shortfalls on this scale will require a comprehensive approach to water policy—including the 11 recommendations outlined by the Summit earlier this year along with a host of other ideas embraced by Summit leaders, including widespread conservation, improved water-use efficiency, water recycling, stormwater recapture, and more comprehensive groundwater monitoring. State lawmakers, to their credit, have embraced many of these proposals—at least in principle—and growers, to theirs, are finding ways to manage in this year’s drought. But legislative deals on groundwater management and a new water bond still remain elusive. And there’s no knowing what next year’s water deliveries will look like. The studies may be right: Much of California’s economy will ultimately be unaffected by this year’s drought. But that’s only part of the story. What state leaders decide to do about it will be the next chapter.